Livestock moved out of the Illinois State Fairgrounds with the start of World War II, and soldiers moved in. The U.S. Army Air Force took over the fairgrounds in March 1942 and operated a supply depot and training facility there for the next four years. The Illinois State Fair was cancelled for 1942, ’43, ’44 and ’45. The facility, which ultimately was officially designated the 847th Army Air Forces Specialized Depot, was staffed by hundreds of AAF soldiers and hundreds more civilians. The depot’s focus changed as the war went on. 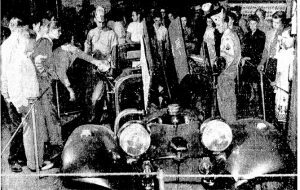 Originally, it was primarily a fuel storage area, with thousands of 55-gallon fuel drums stored near the grandstand. Training gradually became a larger part of its mission, although the facility remained a storage depot as well. 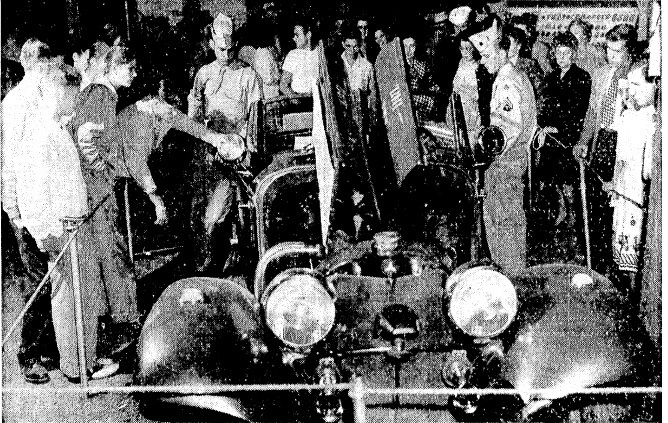 For part of 1943, about 150 Chinese-American soldiers, members of the 407th Air Service Squadron, underwent training at the fairgrounds prior to being deployed with Gen. Clair Chennault’s unit in the Burma-China-India theater of the war. Later, many soldiers stationed at the fairgrounds were taught how to refill oxygen cylinders used by Air Force fliers. 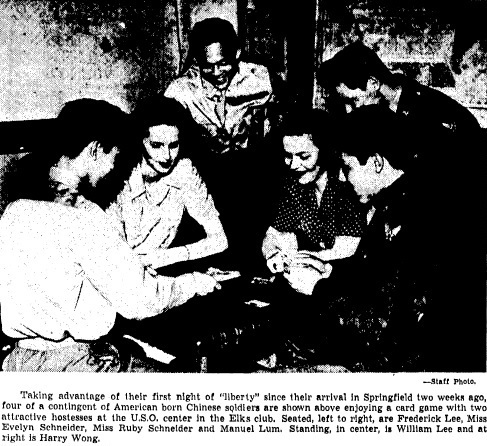 Relations between Springfield and the depot were largely good. Depot soldiers marched in parades and reviews, officers spoke to civic groups, and local clubs and the USO sponsored dances for men stationed at the fairgrounds. For a USO dance at the YMCA in June 1942, the announcement said, “young women from one to 200 on the approved list will act as dancing partners.” At another USO dance, held in 1943 at the Governor’s Mansion, an unwitting Cuban-American GI ended up with Mabel Green, the wife of Gov. Dwight Green, as his partner. In March 1944, however, after a depot soldier was badly beaten in a downtown bar and following a sharp increase in the rate of venereal disease among members of the 847th, commanding officer Col. H.G. Woodward declared three downtown taverns off limits. Only intervention by Mayor John “Buddy” Kapp and other local officials kept depot leaders from banning soldiers from the entire city, the Journal reported. Military Police Maj. Paul Vermillion said his men had been ordered to scrutinize all local hotels, taverns, night clubs and other “hot spots.” The off-limits order applied to the Friendly Tavern, 209 N. Fifth St.; Phil’s Place, North Sixth Street; and the Log Cabin, 113 N. Sixth St.
“Those places ordered out of bounds have been hangouts for underage girls and several times we have had men report having been beaten up in the establishments,” the major stated. Depot activities wound down as the war ended, and the fairgrounds was officially decommissioned on May 1, 1946 – giving state officials just enough time to refurbish the grounds for the 1946 Illinois State Fair that August. The 847th Army Air Forces Specialized Depot was one of four major military supply facilities in Sangamon County during World War II. Two of those, the Sangamon and Oak Ordnance Plants near Illiopolis, are the subject of a previous SangamonLink entry. The fourth was the Lincoln Ordnance Depot, located on 472 acres generally between Hazel Dell and Toronto roads. The depot was designed to be one of the largest rail switching yards for storage and distribution of war supplies in the world. It was served by 22 miles of side tracks and included 2.5 million square feet of storage space, 1 million of that under roof. One of the depot’s primary assignments was to ship finished ammunition prepared at the two Illiopolis manufacturing plants. About 475 people worked at Lincoln Ordnance. The depot largely wound down operations after the war, but remained under federal control as a supply center for years. The site currently is an industrial park. I found this article extremely interesting … especially the section regarding the “off limits” bars in downtown Springfield. In addition, I was totally unaware of the high rate of venereal disease that infested the base. This article was discovered as I was researching the structure that formerly stood just inside the 8th Street Gate on the east side of the roadway known as the “Officers Club”. During the late ’40s and early ’50s this building was used for social events and meetings. My curiosity was why was the name “Officers Club”. Was it something left over from when the military was based at the fairgrounds during WWII? “The most frequently used building on the fairgrounds is the Officers Club, which serves for one wedding reception after another. Thanks for bringing this to our attention. There’s always something new to learn. my grand father michael b. Reagan was a chief clerk there during the war . in the 1930’s he was a member of the cc camp at Murphysboro, Illinois . he took classes at night at the teachers college nearby (siu Carbondale). when the war started the military literally came to his door , to recruit him for working at the state fairgrounds , army air corp depot . they had found out he took business and classes, at the college . they also wanted young men that would work a heavy amount of overtime , as needed for the war effort. any overtime , plus interest , was accrued , until the end of the war . even though he was working in a war support capacity , he was deeply ashamed to be seen as an able bodied man , in public without of uniform .